Do You Know What Type Of Acne You Have? While acne may appear to have the same symptoms, it can vary in severity and frequency due to a whole bunch of reasons. Dermatologists are best trained to diagnose which type of acne you might have but you can educate yourself to narrow down some of your tendencies that might lead in acne. In this blog post, we cover few of the most common types of acne and common causes. Don't know what acne is exactly? You might want to start with our three-part series on How to Understand Acne Better, in which we've covered the basics of acne, common causes and treatments. Here's a quick recap on what acne is: Officially known as Acne vulgaris, pimples are considered to be an inflammatory disorder of the pilosebaceous gland. The pilosebaceous gland are tiny glands in your skin that secrete sebum. Sebum helps in lubricating your skin, protecting it from losing moisture. The most common cause of hormonal acne in women is Polycystic ovarian disease/syndrome (PCOD/PCOS). In this condition, the ovaries are enlarged with small fluid-filled cysts which progress and regress with changes in lifestyle. You may complain of one or more symptoms such as irregular periods, weight gain, acne, coarse facial hair and hair thinning. Apart from PCOD, other hormonal disturbances can also cause acne in both males and females for example, hypothyroidism. At Remedico, female patients who show signs of suffering from hormonal acne are directed towards our in-house gynaecologist for a more specific diagnosis. A gynaecologist may advise you to get certain lab tests such as an ultrasound scan and/or blood tests to diagnose PCOS. This consultation continues on Remedico's online platform again and is confidentially managed, similar to all other consultations. Pro Tip: Certain oral contraceptive pills can worsen acne. Make sure you let your dermatologist know which pills or medications you are currently taking so they can advise you accordingly and better narrow down acne-aggravators in your routine. Don't be shy of raising these conversations with your doctors at Remedico, our medical panel is judgement-free and bring solely the best medical advice your way. Another type of acne is genetic acne. If your parents or grandparents suffered from acne, genetics is the most probable cause. In this Your body may have a tendency to overproduce dead skin cells or sweat more than most, you have a higher chance of clogging your pores leading to acne. The genetic aspect depends on your immune system and how it responds to the acne causing bacteria P. acnes. The main goal is to stop recurring acne breakouts and then further heal the scars that were already there. Often acne can be caused by our own callous lifestyle. Irregular sleep patterns, eating junk food, or poor hygiene levels can cause acne. Think of it as a way that your body pushes back and demands a healthier routine. Lifestyle-induced acne can be relatively easier to treat as it can be significantly reversed with lifestyle modifications. Factors such as stress, poor dietary habits, sedentary lifestyle, alcohol and smoking can cause and aggravate these type of breakouts. Pro Tip: Simple fixes such as adding protein, omega acids and vitamins to your diet along with staying away from sugary and fried foods can improve your skin. Often, you might be diagnosed with combination acne such as hormonal-genetic acne, lifestyle-hormonal acne or any other combination. This means that multiple factors are causing and aggravating your acne. There is no reason to worry here. There are medications to treat acne and control it. While the symptoms of acne might appear to be similar, there might be different causes fuelling the condition itself. If you are wondering which type of acne you might be suffering from, you can take our short quiz and know for sure. 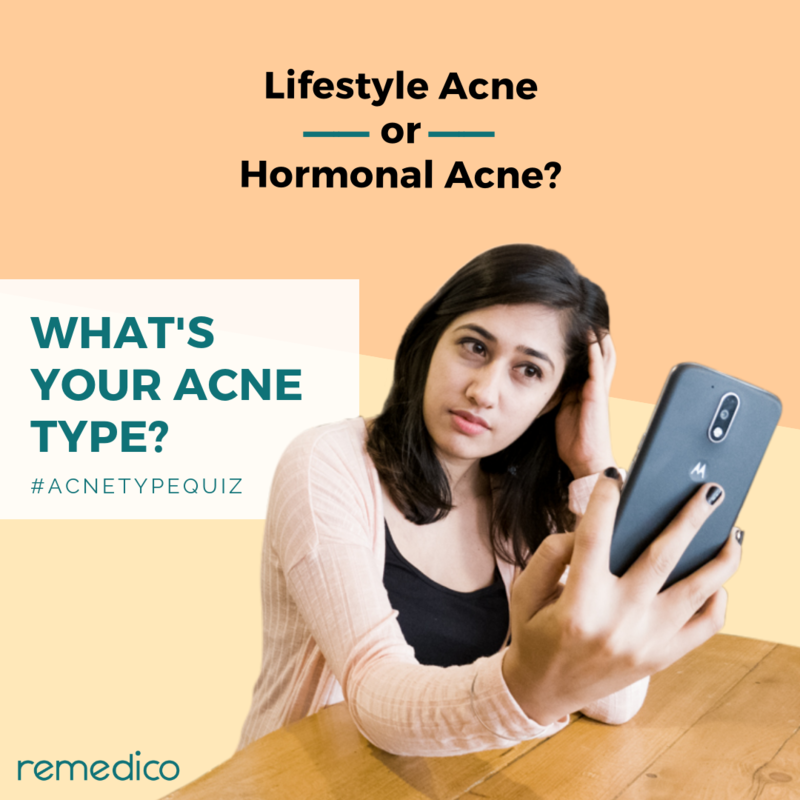 Irrespective of which type of acne you have, Remedico is here to help you through it. You can now consult our dermatologists for your acne treatment, our dietician who can give you advice on your diet, how you handle stress, how you should exercise and other lifestyle changes that can improve your skin. If you are diagnosed with hormonal acne, you can consult with our gynaecologist for addressing hormonal imbalances that may cause recurring acne.